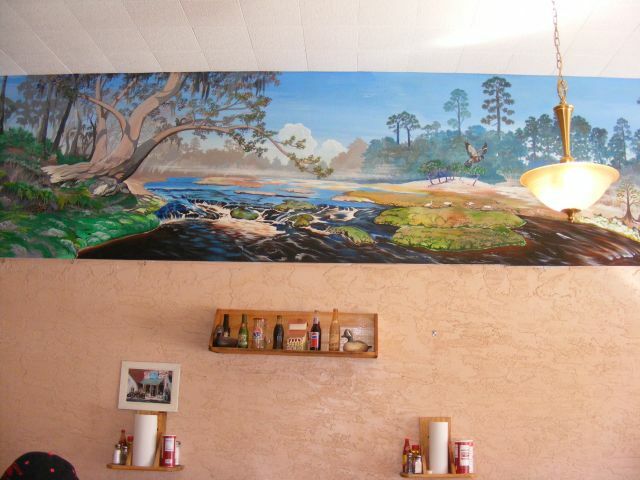 Only one block from the Suwannee River and two blocks from the main entrance to the Steven Foster Memorial State Park is the Suwannee River Diner. 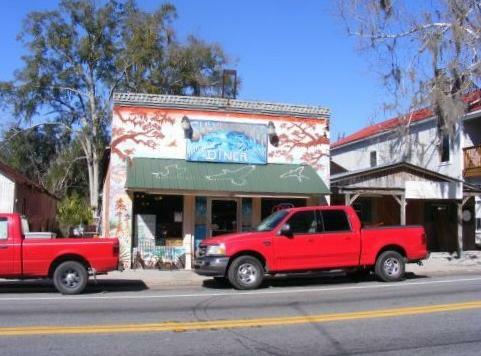 It is located on Highway 41 in the historic town of White Springs, Florida. The diner is family owned and operated by Wayne, Rose, Amber, Kassie, Cody, and Ryan Stormant. It opens for breakfast at 5:00 AM and closes at 3:00 PM seven days a week. Southern home style cooking with both a buffet and menu orders makes the diner a popular spot for the local residents of the White Springs area and visitors. For breakfast they serve the traditional country fare of bacon, ham or sausage, with grits, potatoes, eggs any style, toast, and plenty of hot coffee. From the menu you can also order pancakes, French toast, and a good selection of breakfast sandwiches. The lunch buffet changes daily and there is usually a selection of several different meat dishes, rice, potatoes, and a good variety of home cooking style vegetables. A well stocked salad bar and dessert goes with the buffet. Burgers, fries, catfish dinners, shrimp dinners, and other items can be ordered from the lunch menu. The diner has been expanded to include a banquet room. Call (386) 397-1181 to reserve the banquet room or get information on the lunch specials. The size of the diner when seen from the street is deceptive. 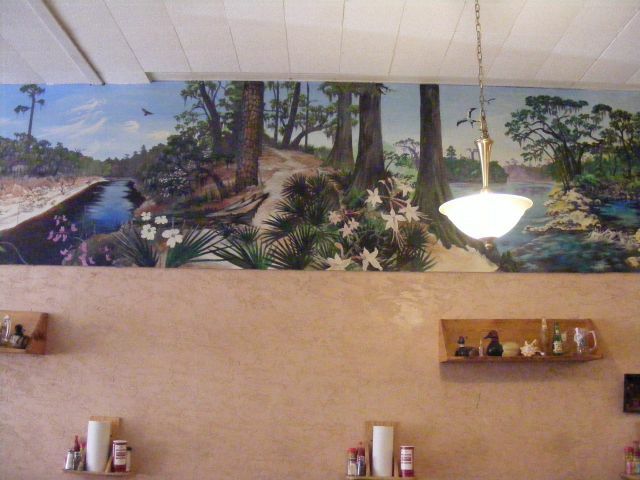 Once inside, the first thing most people notice is the 4 foot high, 160 foot total length scenic mural depicting the Suwannee River from its source in the Okefenokee Swamp to where it flows into the Gulf of Mexico. The booths were built by Jimmy, Rose, and Wayne Stormant. Tables have old historic photos of the Suwannee River, the spring house, and other features of White Springs epoxied into the table tops. Some of the table tops also have sketches and designs done by the artist who painted the mural of the river that goes all the way around the top of all four walls. 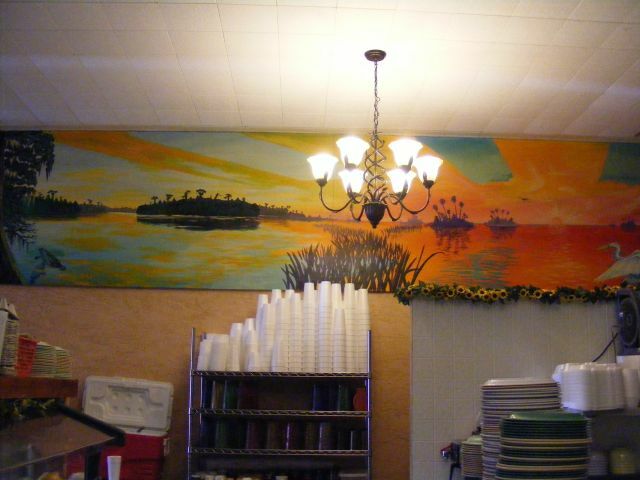 Over the buffet and grill is the first section of the huge mural. 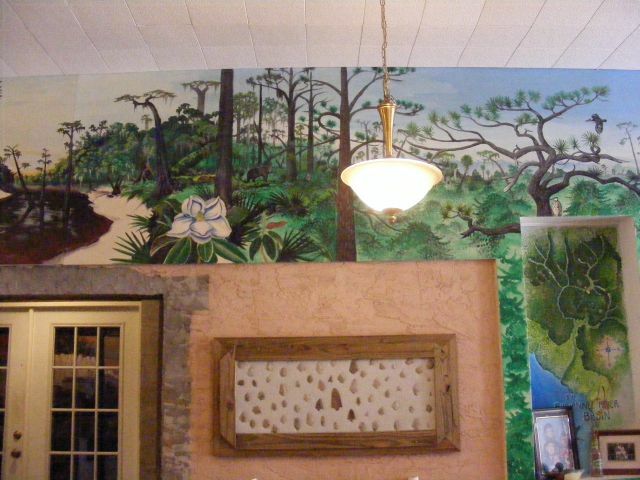 All the vegetation and wildlife in the mural are indigenous to the area of the Suwannee River Valley and for the season of the year which that section of the mural depicts. 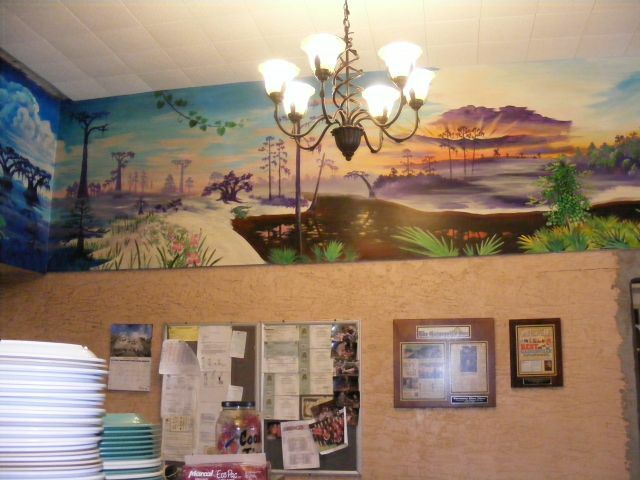 In the first section of the mural you can imagine yourself in the Okefenokee Swamp at night in the month of May. The shallow water of the swamp is dotted with huge cypress, oaks, and ferns with the night birds that live in the huge swamp hunting for prey. Just around the corner, the next section of the mural takes you to the area of the Fargo, Georgia Highway 441 Bridge at sunrise during the month of June. Not only the month of the year and the time of day, but also the characteristics of the river banks, trees, and other vegetation changes as the river winds its way toward the Gulf of Mexico. The next bend in the river on the mural takes you to the Roline Landing Boat Ramp during the month of July. It is mid morning and a bald eagle soars above the dark, tea colored water of the river, stained that shade by the rotting vegetation of the swamps it flows from. On the other bank of the river is the wooded area between Roline Landing and Big Shoals during August. This section of the river has somewhat higher sandy banks and some outcroppings of rock. The large sand bars have cypress and tupelo trees growing on them. Black bears roam the river banks and a pileated woodpecker flies from tree to tree. A closer look will reveal other birds and animals common along the river banks. 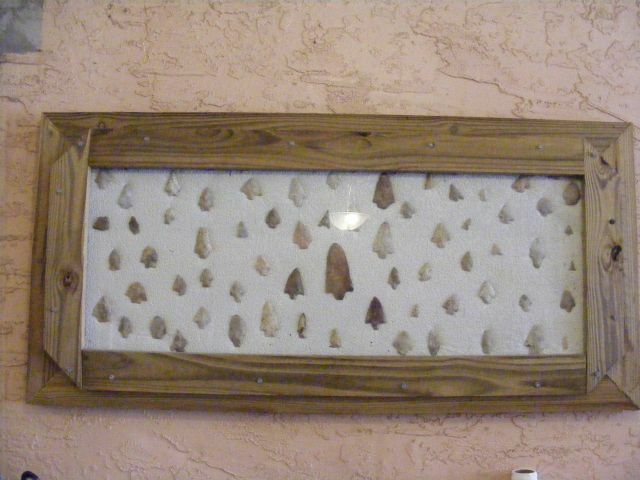 Below the mural on that wall is a large display case filled with arrowheads and spearheads found on the Stormant Family Farm also located not far from the river in that area. The next bend in the river on the mural shows the higher banks and thicker woods around Big Shoals.. The rocks at Big Shoals is where a dramatic change takes place in the character of the river. During times of low water there is quite a nice waterfall where the Suwannee changes from a deep sluggish channel of water to roaring, foaming rapids that rush on to the next section of the mural. It is mid morning in September at Big Shoals. A mallard duck looks for a calm patch of water to land. Egrets and herons feed on the river banks. In the month of October you pass through the sandy scrub area below Big Shoals. A Florida panther lounges in the morning sun on the trunk of a tree deformed by the flood waters of the river in some earlier time. The broom sage is inhabited by gopher tortoise and rattlesnake. Traveling by water is much safer than walking through the high grass. At high noon in November the journey down the mural of the river turns another corner in the wall and arrives at Steven Foster State Park. 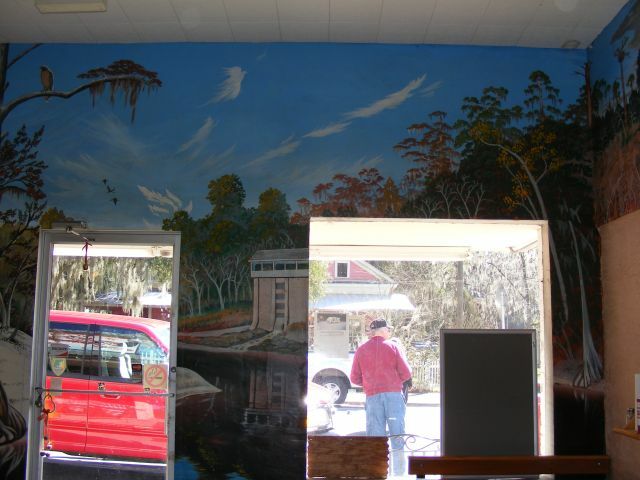 You are still only about half way down the river and the 160 foot long mural as you arrive at White Springs. If you're feeling a little lost you can look out the front door of the diner and see the same spring house depicted on the front wall only a little farther down the street. Ice cold spring water with the scent of sulfur runs from the spring house into the river. The clear sping water starts to make the dark water from the swamps a lighter shade of tan. Here at the spring house another story begins in the giant mural. It is the tale of two brothers. Looking closely at the upper floors of the spring house in the mural you can see a happy, newly wed couple looking down into the forest at the groom's brother who has just begun his journey in search of his true love. Here you must turn another corner in the wall of the diner and another bend in the river. The month is December and it's afternoon at Mattair Springs. High rock bluffs line the outside of every curve in the river and sand bars are on the inside of the turns. Fall colors are on the foliage and a large thunderstorm looms in the distance. The lonely brother still travels down river in search of his true love. A white tail doe and her fawn feed on the winter grasses. 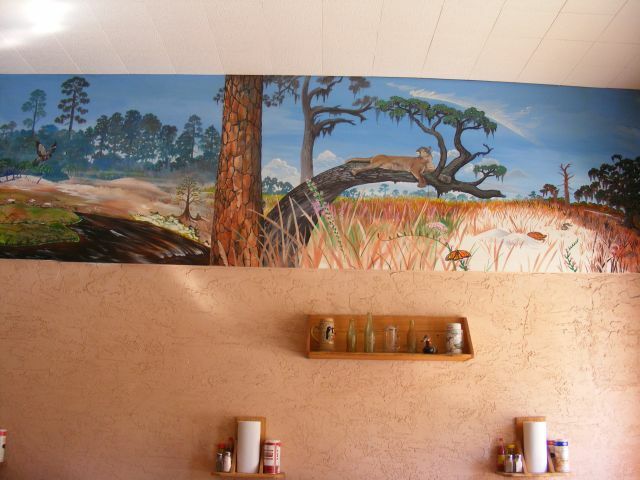 In the months of January and February the mural passes through the flat woods between Mattair Springs and Suwannee Springs. The storm is just about past. Spanish moss hangs from the huge live oaks along the river banks. Wild azaleas open a few early blooms. The fields of broom sage are dotted with bright green palmettos. The lone brother trudges on down river, wary of the wild hogs feeding along the river's edges. It is March and early spring comes to the river banks with bright greens and colorful flowering plants. A well beaten path follows the course of the river as it nears Suwannee Springs. It is late afternoon in mural time. New spring vegetation is popping up along the river banks. Cold, clear water bubbling up from sub-terranian caves flows into to the dark water of the river every few miles and lightens the color of the water a few more shades of tan. Many feeder streams and other smaller rivers join the waters of the Suwannee on its trip toward the Gulf of Mexico. Below Suwannee Springs the water of the Alapaha River, sometimes running above ground and other times running in deeper underground caves, runs into the Suwannee. The Apalacheecola and the Santa Fe Rivers join the Suwannee and contribute their waters to the ever widening river. Running Springs and Manatee Springs flow into the Suwannee. It's March and getting to be late afternoon on the wall mural. The river is changing once more, getting wider and spreading into the low lying land on each side. Islands dot the main course of the river and as it nears the Gulf of Mexico the tides begin to have an effect on the river current, on low tide running swiftly and on high tide sometimes reversing direction for a short while. It is April as the sun dips into the Gulf of Mexico at the end of your pictorial trip down the Suwannee River. The main river channel has split with East Pass flowing to the left and the main channel going to the right. A thousand small islands protrude from the marshy delta. The river is several miles wide at high tide. Deep winding, twisting channels cut through the mud flats and oyster bars for those who know how to find them. For those who do not know the salt flats, only an outboard motor choked with thick mud or a propeller turned into a mass of useless scrap metal on an oyster bar awaits. The river delta is alive with salt water fish, fresh water fish, and wildlife of many kinds. Wading birds feed in the shallows. Manatee feed in the deeper waters and sometimes swim into the springs along the river's edge. 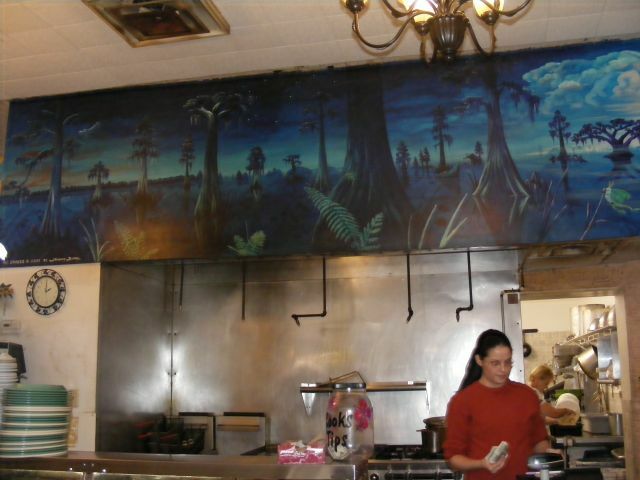 The mural has gone full circle on the walls of the diner by sunset and the next panel will be the Okefenokee swamp at the beginning once more. 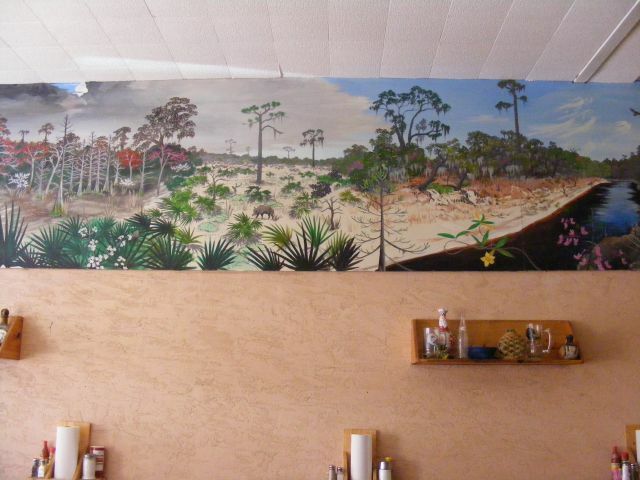 Johnny Dame of Melrose, Florida is the artist who painted this amazing mural. A professional artist, he had painted many smaller scenes, but this was his largest work to date. He stood on a ladder for many hours to paint this 160 foot long wall mural. It was completed during a 12 month period between 2000 and 2001. 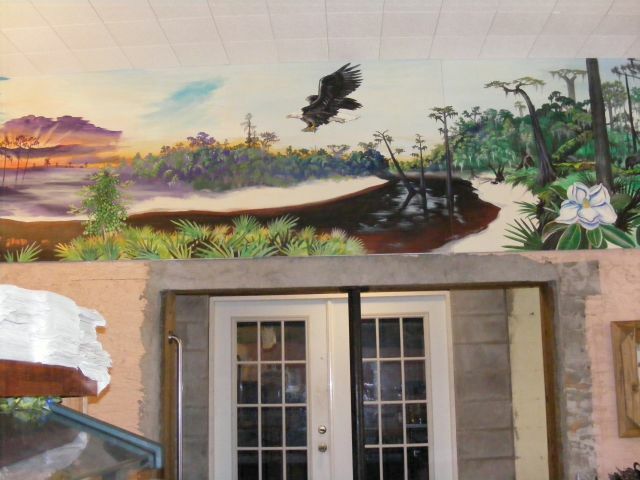 In the mural, the artist hid an alligator, an angel, a coral snake, dragon fly, fish, fox, green snake, Indian profile, mastadon, owl, walking stick bug, and a wolf. 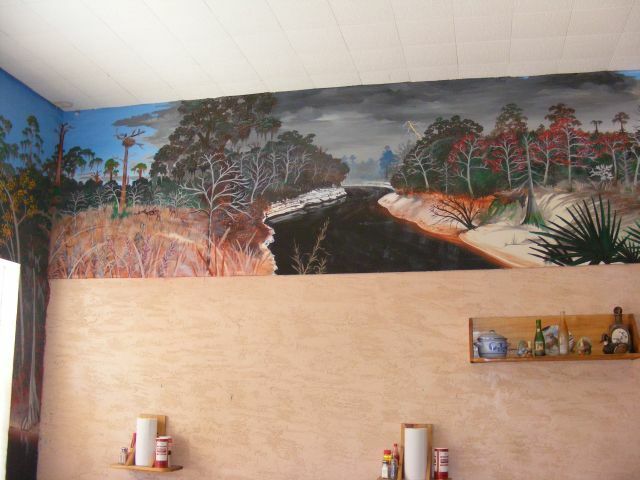 Sometimes customers of the diner forget their food while trying to find all the things hidden in the mural or looking for all the places along the river where the lonely brother is shown wandering. It is obvious that many hours of planning and studying the river went into the painting of the mural to keep the scenes in character with the section of river, month of year, and time of day they represent. Those who know the river agree that the painting is a very accurate representation. 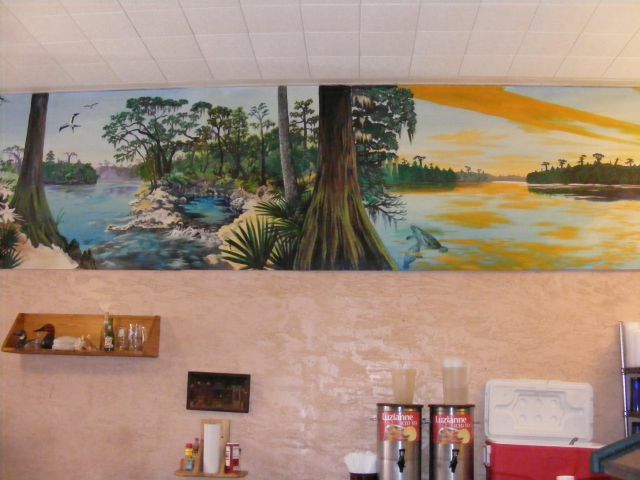 Located just about 35 miles below the Florida / Georgia border in White Springs and only about 4 miles from the Highway 136 exit of Interstate 75, stop by for some good, southern style cooking and a chance to see this wonderful painting up close if you're passing through.